REDDI SERVICES IS HERE TO MAKE SURE YOU ARE COMFORTABLE. Heating, Ventilation, Air Conditioning (HVAC) indoor environmental control systems are designed into commercial buildings to regulate temperature and humidity and maintain indoor air quality with adequate filtration and ventilation. Air conditioning & heating systems, large and small, work best when routine service is performed. Our HVAC technicians are fully licensed and certified, and prepared to repair and maintain all brands of heating & cooling equipment. When the time comes to replace the heating & cooling system, our experts can conduct a full evaluation and recommend the right system to meet your needs. 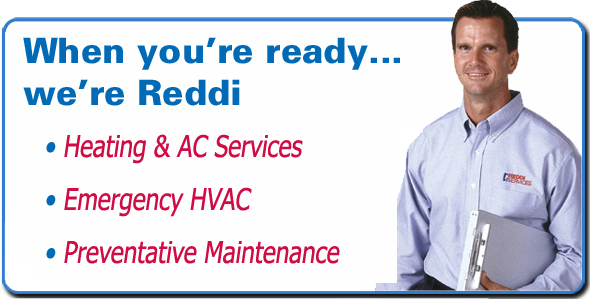 Call Reddi Services Today to Schedule HVAC Service!